Many of my blog posts are focused on Azure cost reduction as this is essential to keep in mind when designing cloud solutions. Azure is a very cost-effective platform when it’s used in the right way, meaning you always have to consider the fact Azure is elastic and make sure your solutions scale up and down in an efficient way. Previously I showed how to autoscale Azure Analysis Services and Azure SQL Database. This time I show how to process Azure Analysis Services objects (models) in a cost-conscious way. In my last blog post I showed how to Process Azure Analysis Services objects from Azure Data Factory v2 using a Logic App. Based on a simple example I showed how to link Azure Data Factory and Logic Apps using a webhook and how to communicate with the Azure Analysis Services (Azure AS) REST API from a Logic App. For this blog post I teamed up with a cloud integration specialist from Macaw, Stefan Conijn, to create an advanced Logic App that scales Azure AS up, processes your Azure AS objects and scales Azure AS down again. This is a common pattern as processing is a memory consuming operation, which often requires to scale up. The solution is cost-conscious because it waits for the process operation to finish after which Azure AS will be scaled down immediately. The Azure AS API is asynchronous. The only response you will get will be a 202 (accepted) status code that tells you the message arrived successfully, but that’s it. You need to poll for progress yourself. This is actually one of the advantages of using the API for processing because the traditional methods may require long-running HTTP connections. Given the nature of HTTP, it may be more reliable to avoid long-running HTTP connections from client applications as you can read in this blog post by Microsoft. Logic Apps can be whitelisted on your Azure AS firewall because the outbound IP adresses of Logic Apps per Azure region are published online. This means you can keep your firewall on while processing your models using a Logic App. The Logic App is by default configured to process your entire model. You can change body of the request to process specific objects (tables/partitions) as desired. Below a screenshot of the Logic App. Every step is numbered and explained below the screenshot. The actual trigger for the Logic App. Can be triggered manually or via an HTTP POST request. A variable used to stop the ‘do until’ loop statement when upscaling of AAS is finished. A variable used to stop the ‘do until’ loop statement when processing of AAS is finished. A variable used to check if processing of AAS finished successfully. 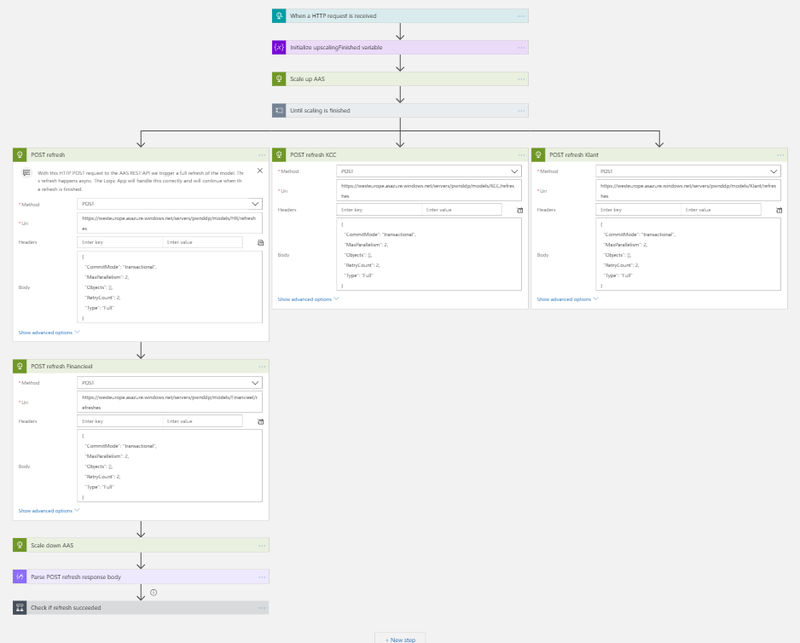 HTTP PATCH request to the Azure Resource Management API to scale up the AAS instance. ‘Do until’ loop that is used to wait for the upscaling of the AAS instance to finish. A delay of 30 seconds in each cycle of the ‘do until’ loop. HTTP GET request to the Azure Resource Management API to poll the status of the scaling process. Parse the result of the GET request above, so that we have easy access to the response object. Condition to check whether the scaling was finished. If so, set upscalingFinished variable to true so that the ‘do until’ loop is discontinued. HTTP POST request to the AAS REST API to trigger a refresh of the model. ‘Do until’ loop that is used to wait for the processing of the AAS model to finish. A delay of 30 seconds minute in each cycle of the ‘do until’ loop. HTTP GET request to the Azure Resource Management API to poll the status of the refresh process. Switch over the possible processing status values: inProgress, notStarted, succeeded or no matching value. If status equals succeeded set variables processingFinished and processingWasSuccessful to true. If status has no matching value, set variables processingFinished to true and processingWasSuccessful to false. HTTP PATCH request to the Azure Resource Management API to scale down the AAS instance. Check if processing was unsuccessful. If processing was unsuccessfull set the status of the Logic App to ‘failed’ by using a ‘terminate’ action. If processing was not unsuccessfull do nothing. Deployment of the Logic App to your own Azure subscription is easy. First make sure you have a Service Principal (App Registration) that has the 3 permissions below. Now go to my github repository and click on the “Deploy to Azure” button. After you have logged in to Azure to following form appears. Fill the required parameters, agree with the terms and click on Purchase. After the deployment go to the created resource group and click on the Logic App resource. Click on Edit and verify that it was deployed correctly. Run the Logic App! Many thanks to Stefan Conijn!! Can we parallel proces more models dynamically? E.g. a JSON parameter array in the POST body? Hi Christian, can you try again? Stefan and I just published a new version of the Logic App. Please let us know if everything works as it should now! Hello Jorg. In my version, the Scale down AAS (step 10) starts before the POST Refresh step 9 has finished. Step 10 is starting a few seconds after step 9. My understanding is that by default the logic app will only continue to step 10 once step 9 has completed as it’s asynchronous by default? Hi Matt, Stefan and I just created a new version of the Logic App that loops until processing is finished before scaling down. Can you try deploying from my github repository again? And please let us know how it went. I have just tested it against a large model and this went fine now! Thanks Jorg. I was actually building my own version from scratch and using yours as a guide. Interestingly, at step 11, for the POST refresh, I found that I needed to disable the Asynchronous Pattern in the Settings. If left enabled, step 12 gets stuck in a loop. I think this is because step 11 would return a 200 response code, but when Asynchronous is enabled it needs to see a 202 response code coming from Step 11. I have it working now, so thanks! Great to hear Matt, I’m glad it’s working now! Yeah, Stefan and I noticed this also and therefore we added the loop at step 12 to wait for the processing to finish. If you have any more feedback in the future, just let us know! Hi Jorg and thanks for sharing this setup on github – not much is available for azure yet. I have rechecked all the security on the service principal and am unsure how to continue. Any ideas? Is this Blog code available for download of Github where I can see what are the issues I have in the code as the process dont stop and I keep getting 409 conflict error as I am trying to process tables in a sequence with number of partitions and it refuses to wait. How can I get the live status of cube processing like a status bar saying this much percentage is completed or some estimated end time.. etc.. Please help! any idea of how I can obtain the Refresh ID? On your HTTP request where you’re posting the refresh, if you hit the ellipsis top right it opens a settings panel. There is the option to make the request synchronous which resolved the issue where you don’t receive the location in the header response. From your experience what is the best way to debug aas refresh logic app? I’ve recently noticed that refresh fails and finishes successfully almost randomly. It just fails after 10 minutes of processing. Manual refresh always goes well, but being called from logic app it’s unpredictable (and this is not acceptable in live). Could you please advise, how to debug the app?